Hobbit - Thorin`s Dwarven Sword Replica Noble Collection(NN1276) Officially Licensed Swords and Weapons made by United Cutlery and other manufacturers from The Hobbit movies. 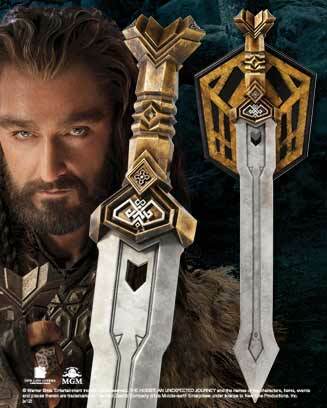 Noble Collection Thorin's Dwarven sword is officially licensed adult collectible reproduction from the Hobbit movie. Blade made with stainless steel. Handle made with steel alloy. Comes complete with a wood mounting plaque.